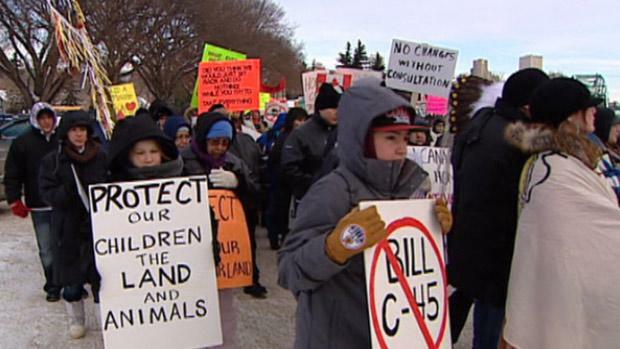 Idle No More protesters like these in Edmonton want more consultation on the government's omnibus budget bill, which includes navigable water legislation. The Idle No More movement and Saskatchewan’s rural municipalities are on opposite sides of the fence regarding protection for navigable water. Members of Idle No More have been in the headlines recently with flash mobs and road blockades across Canada in protest of a budget bill that they say affects First Nations rights. Among their concerns is the federal Navigable Waters Protection Act, which protesters say takes away their right to consultation on construction projects that could affect water bodies. The chief of the Federation of Saskatchewan Indian Nations Perry Bellegarde says indigenous rights over land bordering water were never given up in the treaties. "And so we need to be involved with the whole issue of water, and the monitoring, and the control, and the review, and the regulation and everything else," he said. But members of the Saskatchewan Association of Rural Municipalities (SARM) are claiming a victory with the change to navigable water legislation. "We’re ecstatic about that," president David Marit told delegates to SARM’s mid-term convention back in November. "It’s a long fight that we’ve had to deal with and we finally got what we wanted." Under the omnibus Bill C-45, the law has been renamed the Navigation Protection Act. Small streams are no longer under federal scrutiny. In fact, in Saskatchewan, only three bodies of water remain under Transport Canada’s oversight: the South Saskatchewan River, the North Saskatchewan River and Lake Athabasca. Marit said the change is the result of a 10-year battle waged by Saskatchewan RMs. "We were the leading advocate across Canada on this issue and we got it," he said. He said it means streams that only run during the spring season no longer come under the Act. And there’s "one less bureaucracy that we have to go through for approvals on either bridge or culvert replacements." Under the old Act, RMs had to submit a project description and plans to Transport Canada, and wait for approval. Some smaller projects and water bodies were exempted under an earlier round of amendments in 2009. Marit says "what was left in and what was left out, nobody really knew so you had to get it clarified", adding bureaucratic delay. He says now RMs won’t have to seek Transport Canada’s permission to replace old bridges with culverts (steel pipes). The switch cuts the cost of construction by about two-thirds, saving hundreds of thousands of dollars on each project. John Lawson was reeve of the RM of Meadow Lake when it rebuilt a crossing on Alcott Creek that served a prime logging area. A larger culvert was installed, and the road modified. Lawson considers the approval process that was required for that project an unnecessary burden and delay. "Unless you were into doing a whole bunch of canoeing in water that’s less than a foot deep, and willing to cross about 125 beaver dams per kilometre you wouldn’t be doing too much navigation in that creek," Lawson said. "There’s no question at all that the change is good because you then will have to have a lot less red tape, a lot less delays in working on a project like that," he said. "Well, if those are the only three you have left, you are looking at a lot of water that is definitely used for summer activities in the province that should be looked at under some sort of control. Now whether it has to be under the federal one or not, you know that depends on what legislation the province has," Lawson said. In fact, any works affecting a water body require the approval of the province’s Water Security Agency, so SARM’s David Marit says he’s not worried. However, the Saskatchewan Environmental Society takes a different view. "It’s not like the federal government has transferred resources to the province to be able to take these tasks on," said the director of environmental policy Peter Prebble. "The federal government has in effect gutted environmental assessment legislation, it’s gutted the Navigable Waters Protection Act, and it’s gutted the Fisheries Act." The group Ecojustice says approval under the navigable waters law used to trigger a federal environmental assessment, but that is also gone now. And, there is much less opportunity for public comment on projects. Meanwhile, for the Idle No More movement it’s less about technical details and more about their view of the general direction environmental protection is headed. "It brings into question Creator’s Law," said Bellegarde. "That’s our job as indigenous peoples is to respect Mother Earth because we are of the land and we are of the water. And once waterways are affected, that really affects that relationship to the Creator’s Law and our inherent rights."